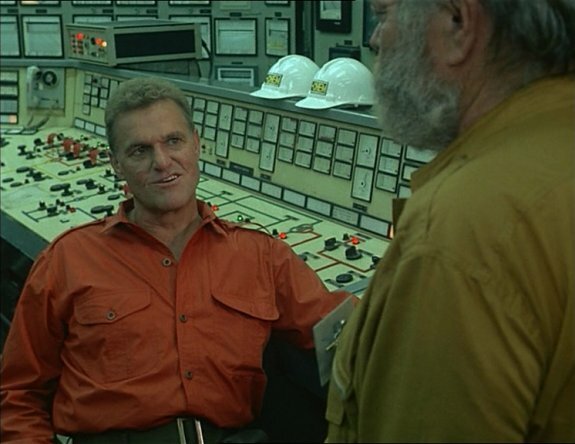 I really couldn’t tell if Charles Napier’s Colonel Kovacks, the evil chemical plant operator, was supposed to be the bad guy in this mouth-watering alien slime drenched Italian jungle/horror/sci-fi casserole. Napier ruthlessly pursues a couple of trespassing environmental activists, cusses out his employees, shrugs off the Chicken Little whining of his head scientist (first about the problems with the volcano they are using to dump toxic waste in and then about the strange burrowing creature that’s terrorizing the plant) and settles on a plan of blowing everything to back to the Stone Age to defeat the creature. How can you not admire a guy who, when given dire information about the alien, smirks and says “don’t worry about it Geoffrey because this is war and that’s something I know a lot about.” First environmentalists and now this? It’s all just more asses to kick for Col. Kovacks! Jane and Lee are the eco-terrorists bent on messing up Kovacks’ day as they sneak onto his island to document the secret nuclear waste disposal taking place under cover of EChem’s geothermal plant. I was rooting against these dopes right from the beginning when their sneaky plan consisted of just taking a boat to the island and hoping Kovacks wouldn’t notice. Even dumber was that they met up with a missionary who lives with the locals which made you wonder why they just didn’t openly go to the island pretending to be working with the missionary. That Jane would later meet up with Bob, a snake hunter living on the island, made it apparent that the area wasn’t exactly off limits to everyone but EChem employees anyway. 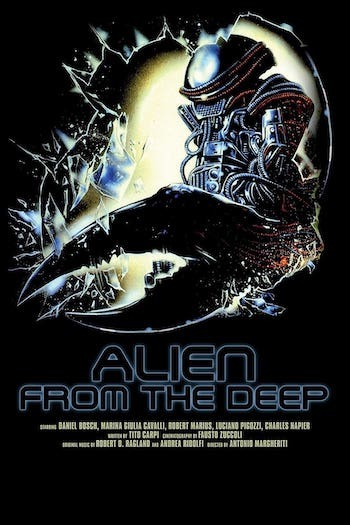 Those of you hoping to see slimy aliens eating hippies and polluting businessmen are in for a bit of a slog through the first half of the movie. No alien appears until after about the halfway point, meaning you get forty minutes or so of Lee and Jane running through the jungle and then through the chemical plant, while Kovacks periodically swears at whomever has the displeasure of telling him they can’t be found or that the plant is in danger of exploding. By the time Jane makes her escape (by unconvincingly jumping out of a helicopter) and meets Bob, the regular viewer has no doubt just given up and chalked the title up to some nuclear fallout-level bait and switch tactic. Fans of director Antonio Margheriti (Jungle Raiders, Cannibal Apocalypse) though are on the edge of their seats waiting for the master of miniature destruction to unleash the budget-conscious special effects and action that are the hallmarks of a body of work that almost never fails to entertain despite their cheap, trashy origins. Once the alien finally makes its appearance, you can be forgiven for thinking that the film is called Big Fake Claw From the Deep. 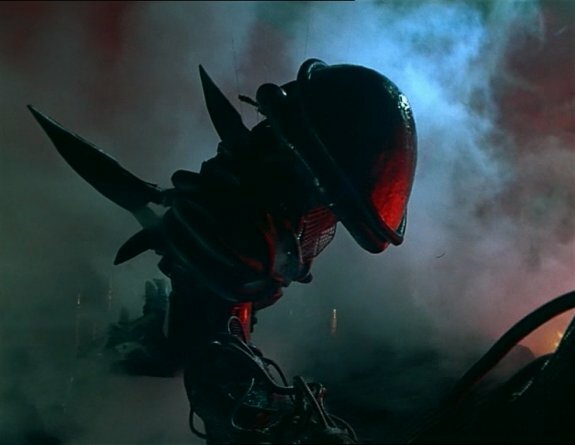 But if you think that Margheriti has cheated you by only having a big pincer swinging around, you understand the over emphasis on showing just the claw once the whole alien is revealed near the end of the movie in all its wobbly, marionette with vacuum hoses glory. Dr. Geoffrey theorizes that the alien came from far away and was attracted by the energy in the atomic waste EChem is disposing. The creature is also trying to adjust its metabolism to our atmosphere. And the only long shot way to stop it is to use the special gun the doc has developed which absorbs hydrogen. Huh? Have you been sniffing the spent fuel rods again, doc? Can you really blame Kovacks for going with the “blow everything up” plan after hearing all that nonsensical babble? 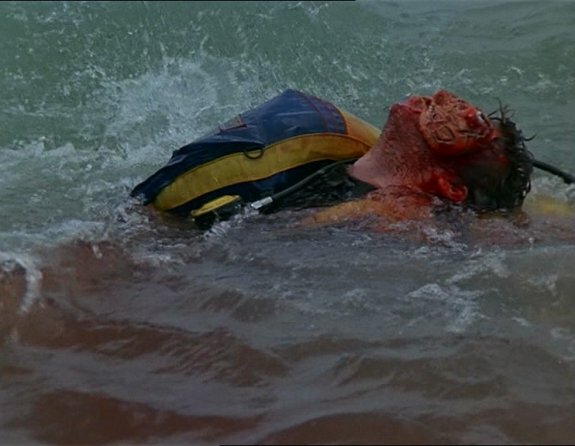 Margheriti pours on the alien attacks and general mayhem nonstop for the last third of the film. Included are such priceless moments as the doc advising Jane to use the decontamination shower after she gets monster slobber on her, Jane worrying about recovering a video tape that incriminates EChem despite an ongoing alien rampage, and the front end loader vs. rickety alien (are those wires I see holding this beast up?) showdown to close out the film. Again confounding expectations and overcoming a slow start Margheriti delivers a fun film with Napier and Luciano Pigozzi (Dr. Geoffrey) excellently chewing scenery in their respective roles. While the good guys are the expected colorless no name hacks, so many plastic models of the power plant are blowing up between bouts of Mega Claw swiping at people, their lameness is an after thought. What makes Margheriti such a good exploitation filmmaker is he understands the whole point of such movies. One scene in particular that illustrates this is when the snake hunter tries out the doc’s dopey hydrogen absorbing gun on the monster. Just how dull will it be to watch an invisible gas sucked out of a monster? Not dull at all because it looks exactly like a flame thrower and it melts his face off! Did that make any sense? Who cares? The monster’s face got set on fire! Thank you Antonio for knowing that what regular folks want in their alien invasion flicks isn’t logic, but stuff burning!